Under no circumstances trust an application that is named Media Manager since it is an invasive adware program that will is not capable of providing any beneficial features. Avoid all claims urging you to obtain this piece of software because it could be used as an excellent download manager as it should allow you to sort them out in a very convenient way. Even if all of this sounds tempting to you, you must be aware of the fact that no such functionality will be provided; instead, it will cause various disruptions every single time you decide to surf the web. For as long as this ad-supported program is fully active on your computer, your daily online activities will become annoying and bothersome, to say the least. Make sure to read the rest of our reports to find out how exactly Media Manager functions and why its removal is recommended. Along such information, we present a detailed removal guide crafted by our research team to help you delete this adware in the most efficient way. The first thing that you will notice right after Media Manager successfully enters your PC is a vast amount of devious web content within your web browser. Usually, such content comes in forms of invasive coupons, commercial ads, and annoying pop-ups, which will usually be marked with text under it such as Powered by Media manager, Brought to you by Media Manager, or Ads by Media Manager. All of this happens due to a combination of files and registry entries working together; a background system service of this devious application is the main reason, all the web unwanted content is provided to you. This is so because the service in question initiates lasting connections to various adware servers, which are the primary source of all the annoying ads, pop-ups, and coupons. It goes without saying that such activity will not improve your overall online experience. Unfortunately, breaking down these intrusive connections is not an easy task and might not always work the way you wish. This is so because the dubious system service often has a random name; thus identifying it is a rather challenging task and even if you are able to do so and then kill it by using the Task Manager, it will most likely automatically restart itself. This is why it is important to delete every single file and registry entry associated with Media Manager. Only a complete removal of this adware program will ensure the stoppage of its intrusive functionality. 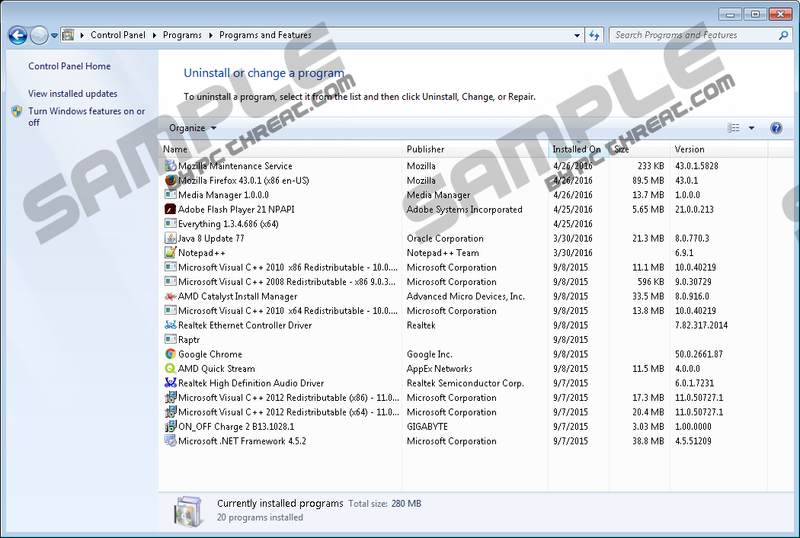 During our investigation, we have found out that in the majority of cases this adware program comes via bundled installers, which are mostly up for download on questionable third-party websites. Thus, it is not surprising whatsoever that we highly advise you to bypass all such websites at all times as it will dramatically decrease the chances of getting your PC infected in such a way. There are some additional steps that you should take to improve your virtual security. Along bypassing devious websites, you should always learn about the application that you want to run on your computer as much as possible before downloading and installing it. This is extremely important since manipulative marketing strategies are a very common technique used by developers of dubious software used to lure users into acquiring their invasive products. Last, but not least, make sure to also implement a professional antimalware tool on your computer if you do not have one already. Such a tool is an imperative part of virtual security since it can detect and inform you about any questionable site or installers in advance. Even though the removal procedure might seem rather simple, you should not take it lightly since a single mistake could result in an incomplete removal of Media Manager. This is not a situation that you wish to find yourself in as leftover linked to this adware could have unwanted outcomes, to say the least. For instances, just a few leftover files or registry entries associated with this ad-supported program could still be used by it for its intrusive functionality. This is the main reason we highly advise you to scan your entire operating system with a reliable antimalware tool to be sure that every single bit of Media Manager has been successfully removed from your computer. b) Media_Manager<< random 8 digits >>_updater_service. c) Media_Manager<< random 8 digits >>. d) Media_Manager<< random 8 digits >>_updater_service. Quick & tested solution for Media Manager removal.